A wonderful kids bamboo fibre dinner set in a cute Owls design. This high-quality 5 piece set includes a dinner plate, bowl, tumbler, fork and spoon. 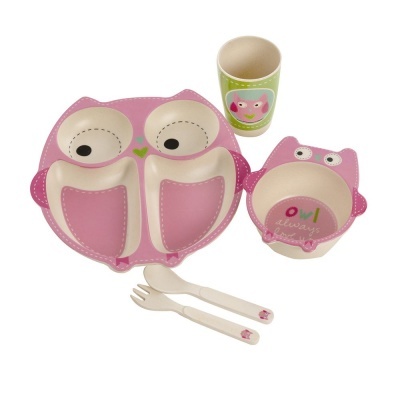 A wonderful kids bamboo dinner set in a cute Owls design. This high-quality 5 piece set includes a dinner plate, bowl, tumbler, fork and spoon. Made with a mixture of sustainable bamboo fibre and melamine to ensure a safe and break resistant tableware. My little one loves this set.